Introduction: The second category of frogs we're going to investigate is perhaps the fastest growing niche. Just about every frog bait manufacturer that offers a standard frog now offers a popping frog to go along with their lineup. Do you have any in your collection? The versatility these baits provide in creating a fish attracting commotion together with being weedless is quite extraordinary. 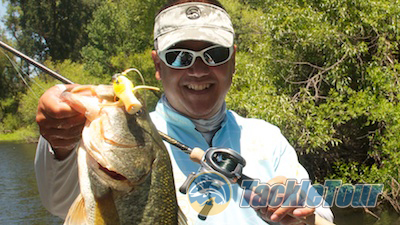 We take a look at three baits in this category of topwater frogs. The first is a long time favorite of ours, and the other two are brand spanking new, introduced at ICAST 2013. The Transporter probably wasn't the first bait of its type to be made, but it's one of the first we remember. Paycheck Baits Transporter: In our small little part of the world that is fishing, we're reluctant to describe a product as being the first of its kind because in truth, ideas and designs are thrown around and recycled so often, it's really difficult to discern truly original ideas from retreads. What we try to say when seeing something unique is that the product is the first we've seen and then fill in the blank. Why do we bring this up? 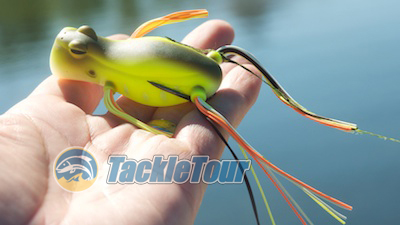 Because upon its introduction, Paycheck Bait's Transporter is the first frog bait we had seen with a concave mouth instead of the usual point. Action: How does this design benefit the Transporter out on the water? Well, as one might expect, the concave mouth makes the Transporter behave like a popping bait when you make hard snaps with your rod tip. 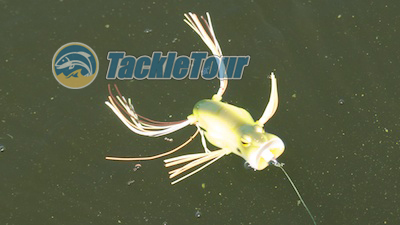 However, what anglers might not expect from a bait that looks like this is if you make quick little twitches with the tip of your rod, you can make the bait walk like other frogs baits as well. That's right, the Transporter not only pops, it walks. What sets this bait apart? It's a hollow bodied frog with a concave mouth. When laying still, the extra skirt material at the front of the bait spreads out just like the customary skirts in the back giving the bait a more accurate profile of a frog floating at the top of the water taking in the sun. Additionally, it has arms to go along with the usual legs. Weedlessness: Despite all the extra appendages, the Transporter is easy to cast into pockets, holes, under docks, and amidst mats and other overgrown vegetation. Overall, it slides through these obstacles very well coming back to you too always landing upright on a cast and rarely getting caught up on the retrieve despite its wide mouth. 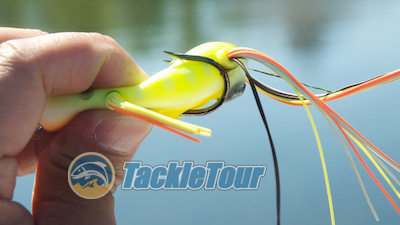 The body of this bait rises pretty far above the hook points. Taking on Water: One of the unfortunate characteristics of a lot of frog baits on the market today is their propensity to take on water. Because these baits are built with a large air pocket for flotation, manufacturers need to provide a way for that air to escape when a fish strikes so that the body of the bait can collapse and expose those hooks when you swing to set. But because there's a way for air to get out, that means there's also a way for air to get in. The body is soft and easy to compress, but still, you have to get it just right for the hook points to come out. It's not a huge deal when it happens and you can usually tell once you get the bait in open water as it will sink rather than float. To expel the water, all you have to do is squeeze the bait with your hand and the water will shoot out. Having said that, not all frog-like baits take on water at the same rate. In our experience, the Transporter is slightly above average in this department not taking on as much water as some of its competitors. Some of our most massive strikes have come while fishing this bait. Hookup Ratio: We've had some of the biggest explosions on a frog bait that we've ever experienced thanks to the Transporter's profile when laying still atop the water. Unfortunately, our hookup ratio has been less than stellar. Frogs in general are a low percentage bait anyway due in part to the type of cover you're throwing these baits into and none of the TT Staff is really sold on the double hooks manufacturers tend to use for these baits. The design just doesn't seem to stick as well as it should across the board. 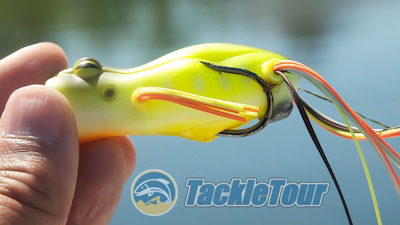 The Transporter hasn't done much to convince us the design of these frog baits isn't flawed to begin with. 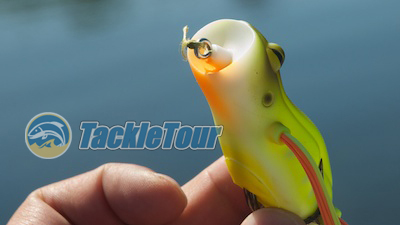 In the water, this bait has a much larger profile than a typical hollow bodied frog. Durability: The plastic shell of the Transporter strikes a nice compromise between being soft enough to compress when needed, yet rigid enough to stand up to being cast into the nastiest of cover. 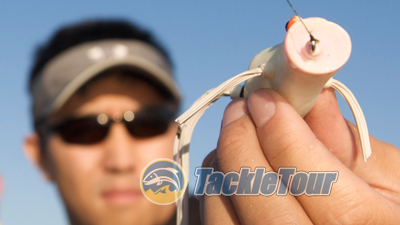 When you do hook up with a fish, the bait doesn't get turned all inside out like we've experienced with other products and we rarely see the hook points of the bait buried in the plastic itself when inspecting the bait between every few casts. 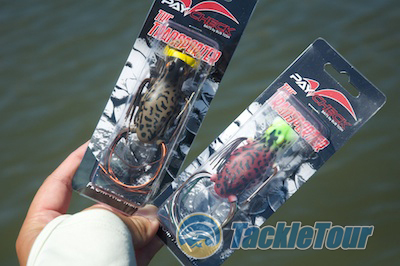 An instant favorite of ours when first introduced to the bait several years ago, the Transporter is a fun bait to fish. Availability: The Transporter has been available for quite some time. It currently retails for $10.49 in about seven different colors, and can be found at Hi's Tackle Box.